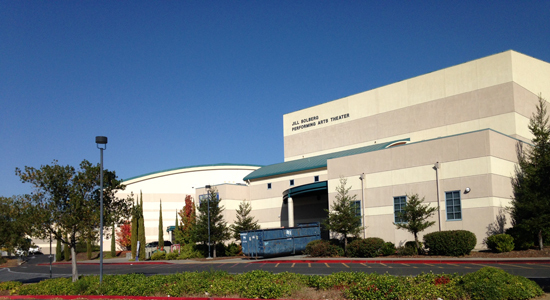 where "Swamiji" the laser show took place on November 9, 2013. 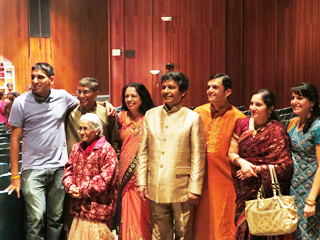 "Swamiji" came, saw and won San Francisco and Sacramento. Like other cities, the show again left an emotional and memorable experience in the minds of the people who witnessed it. 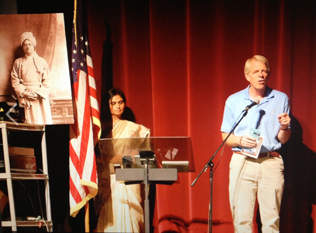 The show at San Francisco was of a special significance not only because this was going to be shown at the most popular city in the West coast, but also because this is where Swami Vivekananda had founded the Vedanta Society in 1899, during his second visit to the USA. He also founded "Shanti Ashrama" (Peace Retreat) in San Antonio Valley, eighteen miles southeast of Mt. Hamilton, California, with the aid of a generous 160-acre gift from an American devotee. 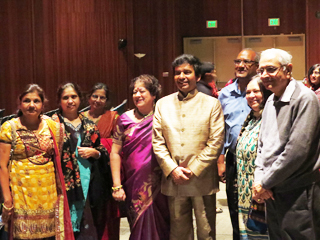 The event started at 4:30 pm by the San Francisco Chapter of SEWA International, where they displayed video projection of SEWA's goal, accomplishments, and gave a series of speeches before introducing Manick Sorcar and handing him the wireless microphone to take over. 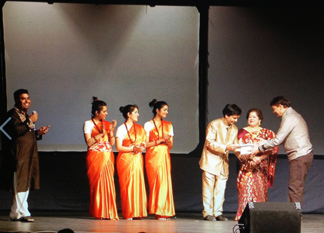 After the show of San Francisco, Manick Sorcar Productions team of seven and their equipment were taken by a mini-coach for a three non-stop hour ride to Sacramento, CA. They reached the hotel at 1 am in the morning of November 10, 2013 to get ready for the next show which was set to be held at the Jill Solberg Performing Arts Center at Folsom, California, starting at 4:30 pm. The preparations for this special event was going for months at Sacramento. SEWA volunteers of all ages worked with great enthusiasm and coordination to mark this as a highly successful event. The volunteers coordinated the MSP stage requirements with the stage technicians well ahead of time. Timely presence and full cooperation of the volunteers made it a painless process for the MSP to set up the stage. 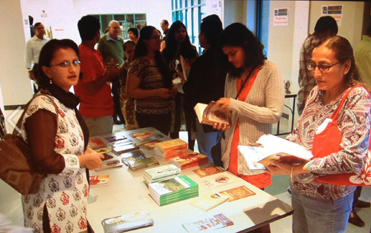 While the stage set up was going on, other volunteers of both genders, young and adult were busy decorating the lobby and other places with Swamiji's portraits, books, SEWA and show posters. People started gathering early for the show. 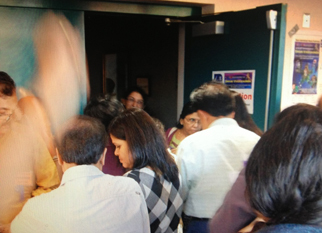 In fact, there was so much rush at the last moment causing a long queue for tickets that the starting time of the SEWA presentation had to be delayed by 15 minutes. 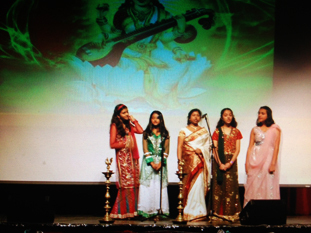 It started with a melodious prayer song to Goddess Saraswati, followed by a video on SEWA's objectives and accomplishments, and speeches by Assembly Member Rojer Dickinson, and Kanchan Chugh. 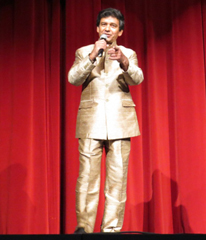 SEWA emcee Ranju Verma then introduced Manick Sorcar eloquently on the stage. 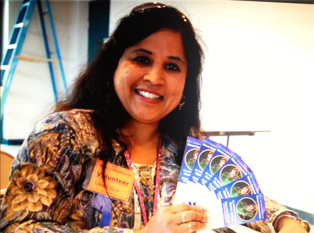 (Clockwise from top) Volunteer Laxmi Rao shows off tickets. Because of last moment rush and long queue for tickets, the show start was delayed by 15 minutes. 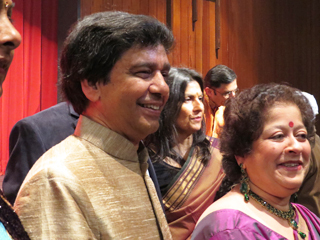 (Right) A group of five including Divya Sinha sing the melodious prayer song, and (above) Assembly member Rojer Dickinson gives a speech while emcee Ranju Verma waits on side. (All photos by SEWA). 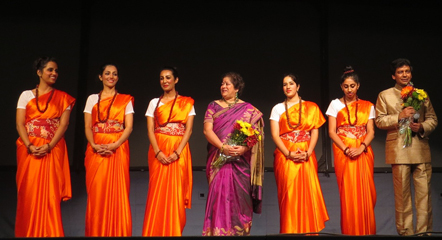 After thanking SEWA for giving this opportunity to perform at Sacramento and other cities across the US, Manick started the show with a prayer dance by his group in combination with laser - devoted to the holy trio. It was then followed by another dance (ballet) to a composition of Swami Vivekananda, and finally the hour-long laser documentary on the penniless, itinerant monk. Following the same pattern of reactions as in all previous cities, the unique 1.5 hour show in Sacramento was experienced in pin-drop silence by the spellbound audience for the entire duration. A roar of applause greeted Sorcar and his group as they came to take a bow at the end of the show. Many waited to personally greet the Sorcars with emotional and heart-felt comments about the show.